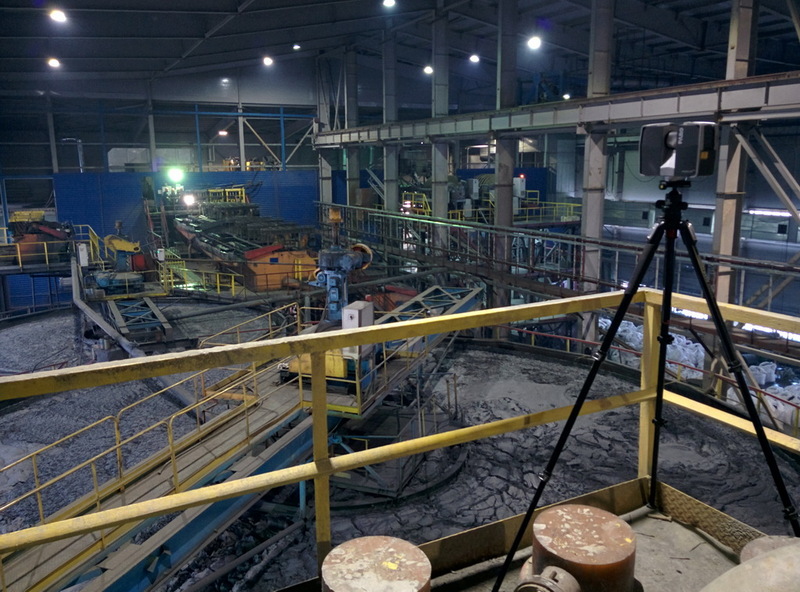 In January 2016, Trimetari Consulting LLC performed laser scanning of the main building of Bogoliubovsky Mining and Processing Plant, which processes gold-sulfide and gold-antimony ore. The purpose of the work is to create an executive BIM-model of the facility. The industrial building with an area of ​​more than 3000 m², multi-level structures, technological equipment and communications were scanned in 2 days. The resulting point cloud was later used to build an accurate and up-to-date BIM model of the factory. The company Novoangarsky Dressing Plant began the development of the Bogolyubovskoye gold deposit from the acquisition of enrichment production in 2015. Bogolyubovskoye deposit, which reserves are estimated at 70 tons of gold, is located in the Motyginsky district of the Krasnoyarsk Territory – in the same place as the Novoangarsk and Gorevsky GOKs, which are part of the NOKGROUP group of companies. With the transfer of property rights, the problem of the unsatisfactory state of engineering documentation of the factory was opened. The lack of quality documentation, both design and executive, makes it practically impossible not only to reconstruct or modernize, but also to operate the plant in an efficient way. After the acquisition of the factory, the new owner decided to restore the documentation using the most modern methods – laser scanning and BIM. Three-dimensional laser scanning provides fast and accurate measurement of structures and equipment, the BIM approach provides storage and management of all spatial and attributive information, as well as other accompanying engineering documentation in a single information 3D-model. As a result of the competition, Trimetari Consulting LLC was chosen as the executor for the laser scanning of the industrial enterprise. After the end of the two-day field stage, it took another 3 days for registration of scans (agjustment in a single coordinate system), quality control and export of point cloud to Autodesk RCP format. RCP is an Autodesk Recap project file designed for working with a point cloud and, along with an RCS file, can be attached to an AutoCAD drawing or Autodesk Revit 3D model. In the future, when creating an information model in Revit using poin cloud, SibtsvetmetNIIProekt specialists took into account the actual position and size of the structures, equipment and communications, which greatly increases the value of the BIM model, as it immediately removes it from a lot of collisions and various errors that are inevitable when building the model from 2D drawings. 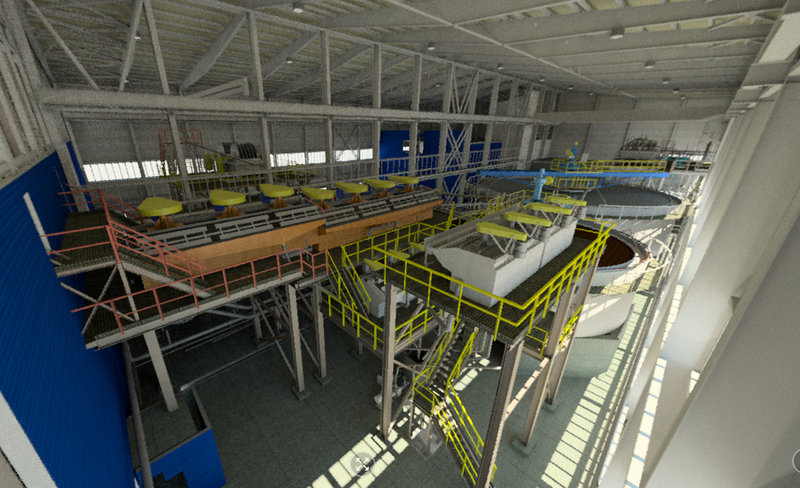 As a result of laser scanning and BIM modeling, NOKGROUP received not only executive 2D-drawings for its production, but a three-dimensional BIM model. 3D-model provides storing of the engineering data, planning of repair and maintenance works, studying various solutions for modernization. Еhe 3D-model is the basis for future reconstruction of the plant. The main area of ​​activity of NOKGROUP is the extraction of lead-zinc ores by the open method and their processing with obtaining of lead and zinc concentrates. The strategic mission of the group of companies is to create the first full-cycle cascade in Russia – from mining ore to producing non-ferrous metals, completely free from impurities, not only in lead and zinc, but also in silver, gold, antimony and other elements. The company is one of the five world leaders in the extraction of lead-zinc ores. The company Trimetari Consulting provides works on laser scanning and 3D-modeling. The company operates its own modern equipment of the Swiss manufacturer Leica Geosystems, the company proud of the great staff – experts with many years of experience. Clients of the company are the enterprises of petrochemical, power, metallurgical sectors of the industry. Trimetari Consulting LLC performs laser scanning in Russia and abroad.